It happens to every artist. There will be many artistic struggles in your life, times when you feel unsure of what you’re making and confused by where you’re you’re going. Other times your art will flow out of you as if it’s the most natural thing in the world. This cycle comes in continuous waves and yet somehow, the struggling part takes us by surprise every time. During those periods of struggle, nothing turns out right, and everything feels wrong. We can’t draw. We can’t make our art. And each time that wave comes crashing down, we feel it will never end, and that we’ll never recover. This is the end. Our inspiration is gone. We begin to believe we have lost our magic. Kiki’s Delivery Service is an animated movie directed by Hayao Miyazaki. The movie was released in Japan in 1989, but I first saw the movie as a sophomore in design school. At the time, I enjoyed the movie as a feel-good, coming of age story about a young girl becoming an adult. That was almost 10 years ago. This summer, I saw the movie again in a special US movie theater release. Watching it now, 9 years later, having gone through the artistic crisis of not knowing where I’m going, what I’m doing, or if I would ever be good enough… this movie took on a whole new light. it almost had me bawling in a public theater. 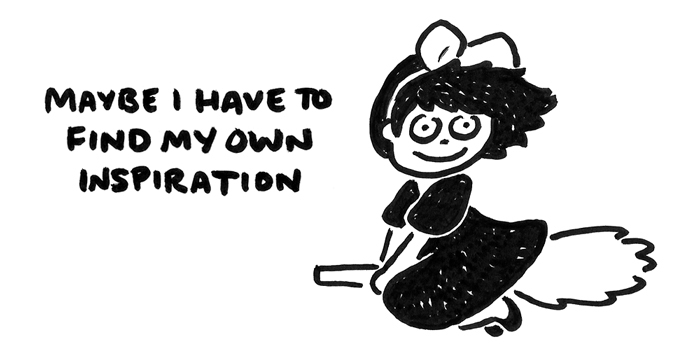 Kiki’s Delivery Service is a spectacular metaphor for the artist’s struggle. Any artist or aspiring artist who watches this movie will immediately relate and see themselves in Kiki. If you haven’t seen it, you should. Immediately. This is not just a story about a young girl transitioning into an adult—although perhaps that’s how I saw it in college because that’s exactly what I was doing at the time. More than that, it’s a story of a young witch discovering herself, her place in the world, and how her magic works. It’s the story of a young artist discovering herself as an artist. The movie begins with Kiki, a young witch, leaving home to go become the town-witch in a new city. 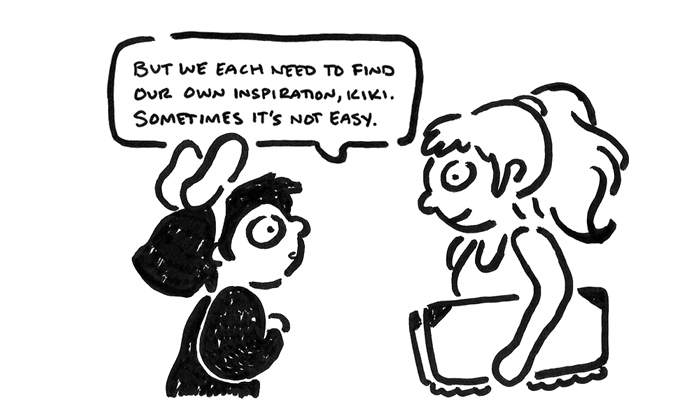 Kiki’s story flows parallel with the path of a new artist. 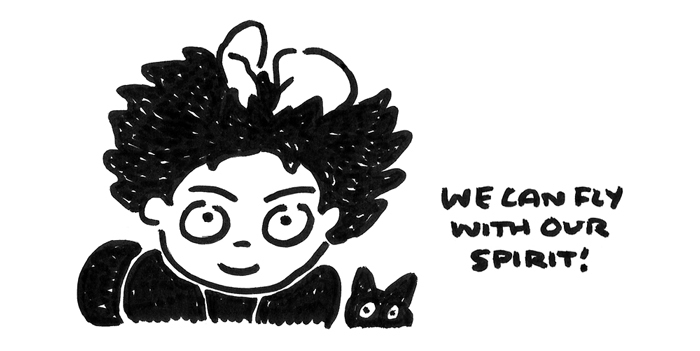 After just leaving home, Kiki runs into an older witch floating confidently through the sky. After speaking with the witch, she begins to compare herself—a brand new witch—to the skills and abilities of this more experienced witch. She finds out the older witch has a fortune telling power, which makes Kiki realize that she doesn’t have any special witch power. Once Kiki finds her new hometown, she immediately feels like an outsider as local teenage girls in colorful outfits snicker at her black dress. Kiki is young and vulnerable, and feels like everyone is looking at her and judging her constantly. Kiki’s pet cat, Jiji, often serves as her inner monologue and gives voice to her inner self-doubt. Kiki worries that she’ll never be good enough to be the witch she wants to be. 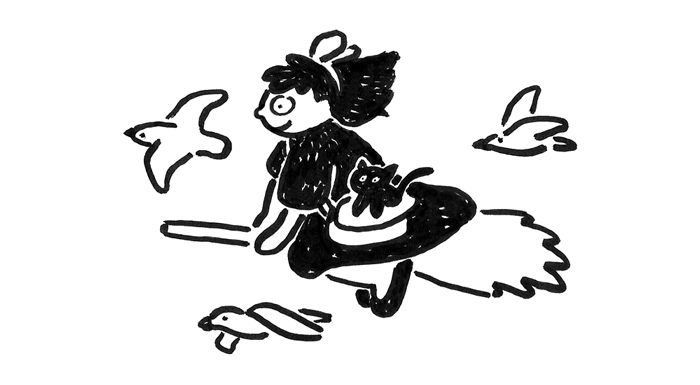 Kiki decides that flying is her special skill, and gets a job at a local bakery delivering pastries on her broomstick. Life is great! She’s combined her passion with making money, and is busy, busy, busy! But her success begins to strain her time and energy. Flying becomes tedious and a just another task to hurry through, instead of the fun source of fulfillment it used to be. After a few disappointing deliveries, Kiki starts to believe her work isn’t appreciated, and stops enjoying flying. She feels hopeless, lost, and depressed. 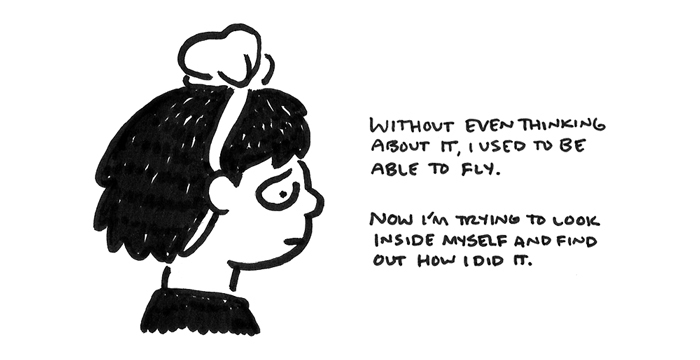 As Kiki sinks into her depression, her confidence tanks and she loses her ability to fly and talk to Jiji. Her magic is gone. And realizing her magic has left her only leads to more anxiety, more panic, and more hopelessness. Kiki has taken on too much, and turned her passion into dull task-work. But her identity is wrapped up in being a witch. If she can’t fly, she can’t be a witch—and if she can’t be a witch, then who is she? This is the low point. Kiki is tempted to quit. She considers giving up and going home to her loving parents and comfortable hometown. Maybe she’s not meant to be a witch after all. Then, Kiki’s older painter friend, Ursula, comes to the city to visit Kiki. Ursula sees exactly what’s happening to Kiki—having experienced it as an artist herself. She invites Kiki to come out to her cabin in the woods to take a break and relax. Being in the cabin and talking with Ursula allows Kiki to step back from her daily life and struggles, and get a fresh perspective. Ursula shows Kiki a painting she’s working on that was inspired by her flying. Kiki is stunned she was the inspiration to such a beautiful piece of art, and amazed at her friend’s work. Ursula: Then stop trying. Take long walks. Look at the scenery. Doze off at noon. Don’t even think about flying. And then, pretty soon, you’ll be flying again. Ursula: When I was your age, I’d already decided to become an artist. I loved to paint so much. I’d paint all day until I fell asleep right at my easel. And then one day, for some reason, I just couldn’t paint anymore. I tried and tried, but nothing I did seemed any good. They were copies of paintings I’d seen somewhere before… and not very good copies either. I just felt like I’d lost my ability. After leaving Ursula’s cabin, Kiki takes some time off. She goes to a friendly old woman’s house she met and bakes pies and helps the old woman do things around the house she can’t do herself. Here, Kiki is able to step back from her own life—she lets her problems go, helps others, and relaxes. Her face visibly begins to unscrunch, and she slips back into her pleasant, peaceful self. I won’t spoil the climactic final scene for you, but I think we all know where this is going. The movie ends with Kiki realizing her magic is inside her and will grow with her. It’s always there and a part of who she is. She just has to remember to continually find her own inspiration and trust in her spirit. All artists have moments where our art seems to drift away from us and our magic seems to disappear. We’re unsure of where we’re going, and if we should be doing this at all. We lose our inspiration and our confidence in ourselves. We feel like we ought to just give up. But Kiki’s Delivery Service shows us the rebirth of an artist who never gave up. 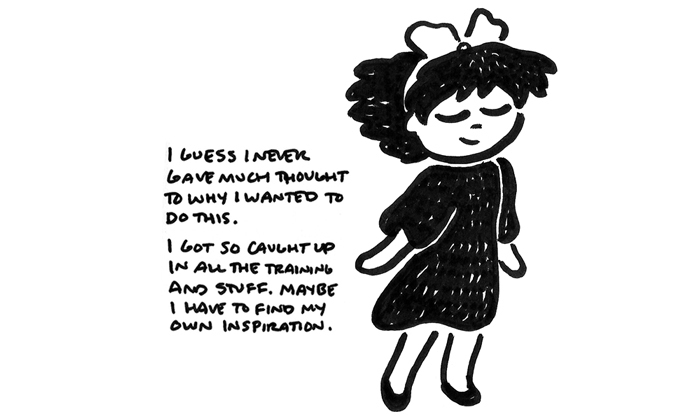 Kiki teaches us that failure is an inevitable part of the creative process, and—most importantly—is always temporary.She shows us that if we stop having fun, the magic will slip away. And when we feel like we’ve lost our magic, we have to trust in ourself, recharge, and find our own inspiration. Don’t give up, and you’ll be flying again in no time.